Hats off to Boston Dynamics. It looks that they have just made a major quantum leap with the Atlas Robot after watching they’re newest video on YouTube. Google bought Boston Dynamics a few years ago, and you can see that the robots have advanced dramatically. Watch as the Atlas humanoid robot walks through the woods, picks up boxes, placing them on shelves, and even picks itself back off the floor after being pushed over. The Atlas also has self balancing and defensive characteristics built in like they’re 4 legged beasts that you saw on the videos from last year. I calculate that by the advancement made with the Atlas, that these guys might be in a warehouse near you by 2025. Here is the video and a link to Boston’s channel is below, enjoy. The Massachusetts Institute of Technology has just released new footage to youtube on September 15th of a new algorithm that they have developed for the Robotic Cheetah. The MIT Robotic Cheetah can run up to 10 miles per hour. The new algorithm allows the Cheetah to jump. Watch as this Cheetah can now jump over one foot high obstacles. Most robotic animals up to date have been powered by internal combustion engines, and hydraulic transmissions. MIT shows you that a electric powered robotic animal can run and jump over obstacles and not make all the noise of an internal combustion engine. 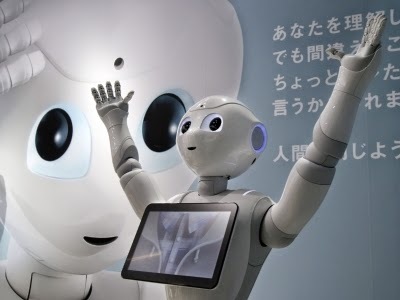 Meet Pepper, the companion robot that can sense a person’s mood and react to it. That’s right, pepper can read your emotions and react accordingly. This robot could soon be in homes across the country when it goes on sale next year. Soft Bank introduced the world to Pepper on Thursday. OutRunner is the world’s first 6 legged running robot that is commercially available to the public. That’s right—a running robot! OutRunner is eating up the competition with amazing capabilities: self-balancing, running up to 20 mph on almost any types of terrains (grass, asphalt, dirt…) with up to 2 hours of battery life. President Obama briefly played soccer with a robot during his visit to Japan on Thursday. The President has been emphasizing technology along with security concerns during his visit. Boomer is a new baby dinosaur robot from the same people who brought you Zoomer the robot dog. He responds to your hand movements. Whatever you do, don’t touch his tail.